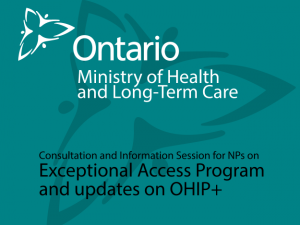 Nurse practitioners (NP) are invited to share their experience in using the Exceptional Access Program, and receive updates on the roll out of OHIP plus. RNAO will be hosting a consultation and information session with the Ministry of Health and Long-Term Care at RNAO home office on Tuesday, Oct. 24 from 1:00 - 3:00 p.m. Web and audio conferencing options will be available. The ministry will be sharing vital information to prepare NPs for this change including the modernization effort of a new online service called Special Authorization Digital Information Exchange (SADIE). Space for this session is limited. If you would like to participate, please contact Cheryl LaRonde-Ogilvie, RNAO Nursing Policy Analyst at claronde-ogilvie@RNAO.ca by Oct. 19. There is no registration fee to participate; however, attendees are responsible for their own travel and accommodation costs. If you are already a member of RNAO, you are automatically covered by our Professional Liability Protection (PLP), which has a duty to defend. If you are not yet a member of RNAO, you can join right now to gain access to PLP and additional resources. Take advantage of our special October Free offer. When you join now for the 2017-2018 membership year, your membership for October 2017 is free. Join online at MyRNAO.ca/join or call 1-800-268-7199. In addition to PLP, NPs that join RNAO enjoy many other membership benefits, including the association's award-winning Registered Nurse Journal, the monthly e-newsletter In the Loop, and our new membership benefit cyber liability protection. RNAO members can earn Recruitment Rewards and get a free membership when they recruit five RNs/NPs to become an RNAO member. To maximize your benefits, join online at MyRNAO.ca/join or call 1-800-268-7199 today.